Noibat in game: 10,365 Who? Important notice! Pokemon Noibat is a fictional character of humans. 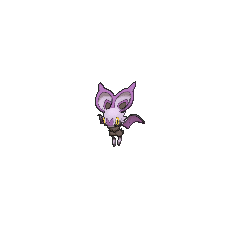 Noibat (Japanese: ????? Onbat) is a dual-type Flying/Dragon Pokémon introduced in Generation VI. It evolves into Noivern starting at level 48. Noibat is a lavender bat-like Pokémon. It has two clawed fingers on each wing and two long toes on each foot. Noibat's hips and chest are covered in black fur. It has large yellow eyes, two purple teardrop-shaped spots on the front of its face, and large teardrop-shaped ears that resemble loudspeakers. When its mouth is open, two pointed teeth can be seen on its lower jaw. Noibat is capable of emitting ultrasonic waves of 200,000 Hertz from its ears, which it can use to stun large creatures, immobilize prey, and determine the ripeness of fruit it enjoys eating. It also uses ultrasonic waves as a means to communicate with other Noibat. Ash's Noibat hatched from an Egg in A Not-So-Flying Start!. He evolved into a Noivern in An Electrifying Rage!. Multiple Noibat made their debut in Calling from Beyond the Aura!. A Noibat appeared in the Pikachu short Pikachu, What's This Key?. A Noibat appeared in Diancie and the Cocoon of Destruction. A photo of Noibat appeared in Summer of Discovery!. Multiple Noibat appeared in the Hoopa's Surprise Ring Adventures short In the Dark. XY033 Noibat Ash's Pokédex Noibat, the Sound Wave Pokémon. Noibat's ears emit ultrasonic waves that can disturb its prey's sense of hearing and damage opponents. XY076 Noibat Ash's Pokédex Noibat, the Sound Wave Pokémon. 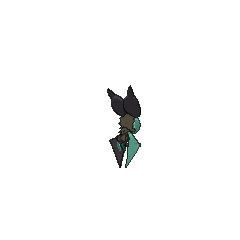 Noibat can cause damage as well as create hearing problems for its opponents by emitting different sound wave frequencies. In the X & Y chapter, two Team Flare Grunts who were after X's Mega Ring used a swarm of Noibat to attack X and his friends near the Super Training Dome. They live in pitch black caves. Their enormous ears can emit ultrasonic waves of 200,000 hertz. Event: A New Pokémon Safari! Moves marked with a superscript game abbreviation can only be bred onto Noibat in that game. 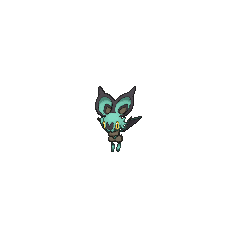 For other sprites and images, please see Noibat images on the Bulbagarden Archives. Noibat has the lowest base stat total of all Dragon-type Pokémon. 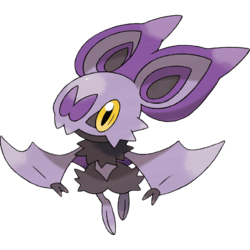 Noibat's German name, eF-eM, is the only Pokémon name that uses the Latin alphabet and does not start with a capital letter. Noibat and its evolution Noivern are the only dual Flying-type Pokémon to have Flying as their primary type. 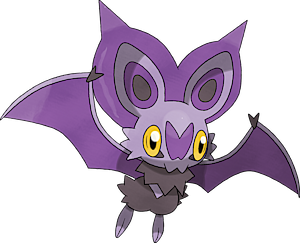 Originally, Noibat's Pokédex entry on the official Pokémon website was incorrect, showing it as a pure Flying-type Pokémon. It has been since rectified. 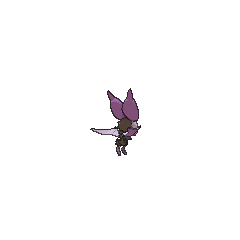 Noibat can be seen as a parallel to Zubat in several ways. They can have Infiltrator as a possible ability. They are Flying-type Pokémon based on bats. They have exactly the same base stats, except that their Attack and Special Attack are swapped. Noibat may be based on a bat, and the design of its ears may be based on speakers. Noibat is a combination of noise and bat. Onbat may be a combination of ? on (sound), ?? onpa (sound wave), and ??? bat.